The only two certainties in life are death and taxes. Benjamin Franklin’s famous idiom hasn’t lost any poignancy in the centuries since its original penning, but our methods of coping with life’s uncomfortable truths have evolved. 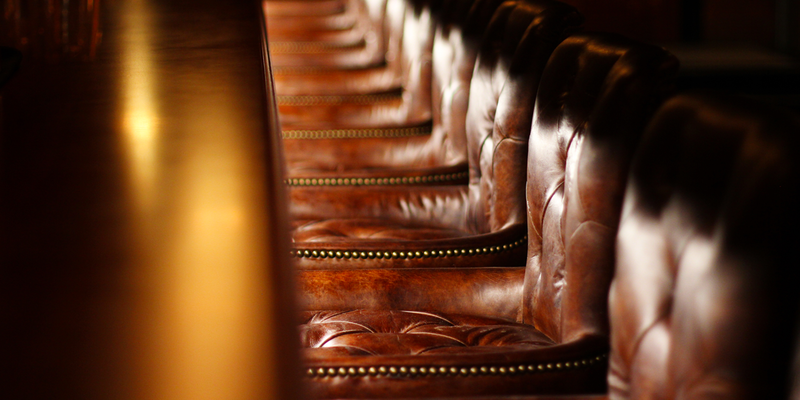 Enter Death & Taxes, the brand-new bar from cocktail kingpin Martin Lange. Along with his wife Wiebke and long-time friends Blake and Belle Ward, Martin has brought his acclaimed style of hospitality to Brisbane City, taking over a bunker in Burnett Lane and transforming it into a moody oasis. Although the weight of the world might rest on your shoulders, ensconced behind Death & Taxes’ blackout curtains you’ll be able to shed stress one perfectly made cocktail at a time. It’s been a busy couple of years for Cobbler’s Martin Lange. In 2017 the enterprising hospitality figure opened heralded Fortitude Valley bar Savile Row, and followed it up just over a year later with Finney Isles. After this flurry Martin would be forgiven for wanting to take things easy, but when the owner of a vacant space on Burnett Lane enquired about Martin’s interest in setting up another bar – this time in The City – the opportunity was too good to resist. The space in question was an empty bunker and storage space that boasted heritage elements – good bones and an energy that resonated with Martin immediately. Martin teamed up with his wife Wiebke, former Sling Bar wingman Blake Ward and Blake’s wife Belle to form the ownership group and got to work on what would become Death & Taxes – a venue custom designed solely to be a great place to drink. 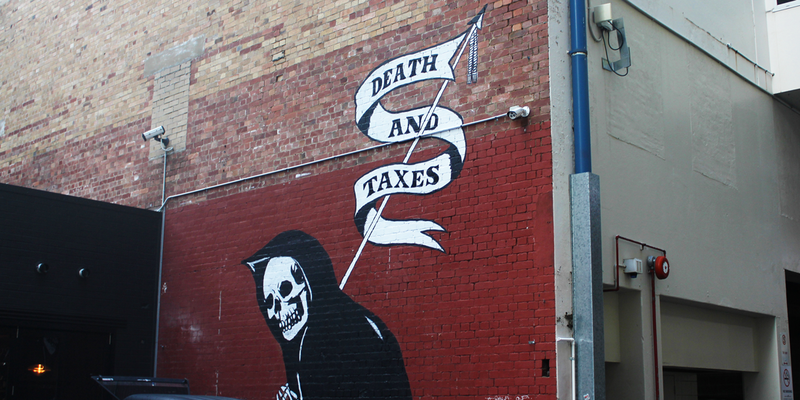 If you meander down Burnett Lane in search of Death & Taxes, the first sign that you’ve arrived will be the Grim Reaper. No, you don’t need to meet your untimely demise to gain entry to this bar – we’re talking about the mural of death’s personification adorning an adjoining brick wall. After spying the spectre, head towards a set of ornate wooden doors (sitting next to some sharp stencil work by Xato Stencil) and cross the threshold into the moody surrounds of the bar itself. A lengthy wooden bar illuminated by overhead lamps will greet you, and as your eyes adjust you’ll be able to make out the sophisticated tile work on the floor and the light glinting off shelves upon shelves of liquor bottles. Death & Taxes has been designed to evoke the lived-in lounge bars of New York, Paris and London, with closed curtains, candles and low leather couches in the back room creating a cosy vibe. Music curated by DJ James Wright helps set the mood, with a curated playlist of low-key funk and soul classics keeping the atmosphere lively. Anyone that has sipped at Cobbler, Savile Row or Finney Isles knows that any Martin Lange-backed venue only serves the best. The same applies to Death & Taxes, where the back bar is amply stocked with choice drops. Martin has recruited Samuel Tripet and Elliot Pascoe to curate the offering, which is larger in parts when compared to Martin’s other bars. A 30-strong cocktail list is the centrepiece of Death & Taxes’ range, offering a simpler selection of concoctions that pay homage to the classics. Martin likens the change to recent trends in dining, where chefs are pivoting to focus on streamlined fare elevated with good produce. Likewise, all of the Death & Taxes cocktails will be made using the finest ingredients, not just the finest liquors. A gorgeous menu will soon be unveiled with detailed illustrations drawn by Martin featuring. The wine list moves away from discernible themes, with the only judging criteria being taste. There’s something for everyone, with older and contemporary varieties featuring. Mainstream beers are available off tap, with an assortment of bottles also available for quaffing. Naturally, the selection of spirits is extensive – 600 bottles are on hand for launch, but the range is expected to grow over time. 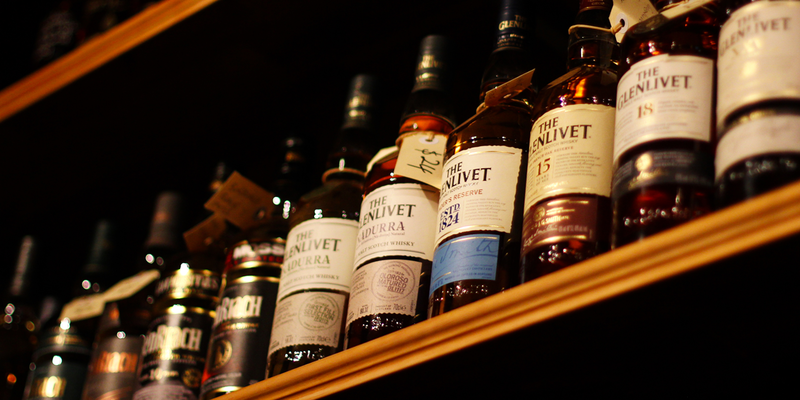 The selection leans towards a whiskey and gin focus, while Martin and Blake are also placing rare bottles from their own collection on the shelves. These bottles – most of which are no longer produced – are for the most discerning of patrons, and include Nikka Yoichi 15-year single malt and Ardbeg 1999 Galileo scotch. Death & Taxes opens today, Thursday April 4. For more details, head to the Stumble Guide.